June is LGBT pride month and multiple cities—including Chicago, New York, San Francisco and Seattle—will hold annual events this weekend. But at a time when society is becoming more accepting of homosexuality, how important is it for lesbian, gay, bisexual and transgender people today to show their support at these public events (which began as annual reminders of the Stonewall riots)? A recent Pew Research Center survey of LGBT Americans found that among LGBT adults, gay men (72%) are the most likely to have ever attended a pride event, followed by lesbians (61%) and bisexuals (33%). When it comes to more recent attendance, roughly equal shares of gay men (29%) and lesbians (23%) had attended a pride event in the 12 months prior to the survey, compared with just 9% of bisexuals. The survey also found that gay pride events are more likely to be attended by those who say their sexual orientation or gender identity is “extremely” or “very” important to their overall identity (66%), than those who view their sexual orientation as less important to their overall identity (45%). Our survey was conducted from April 11-29, 2013, prior to the beginning of this year’s LGBT pride month. 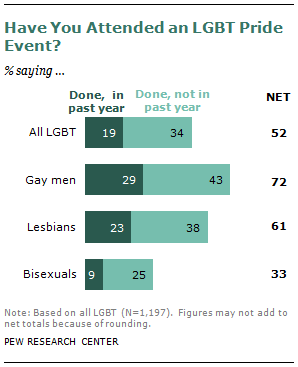 Within the LGBT community, views on the importance of LGBT pride events vary. While about three-in-ten gay men, lesbians and bisexual women think these events help advance social acceptance of LGBT Americans “a lot,” only 12% of bisexual men say the same. 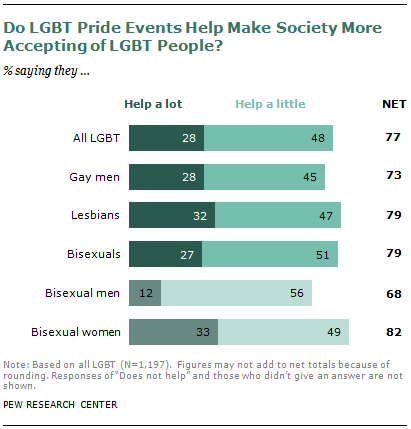 And LGBT adults who have attended a pride event are somewhat more likely than those who have not to say these events help promote social acceptance of LGBT Americans—about eight-in-ten (83%) of those who have attended a pride event say they help at least a little, compared with 71% who have never attended an LGBT pride event.